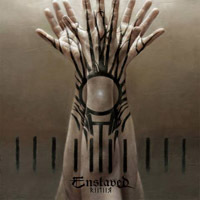 "Thoughts Like Hammers", a new song from Norwegian progressive extreme metallers ENSLAVED, can be streamed at NPR.org. The track comes off the band's twelfth studio album, "RIITIIR", which will be released in Europe on September 28 and in North America on October 9 via Nuclear Blast Records. Virginia based grindcore band PIG DESTROYER have set "Book Burner" as the title of their fifth-full length album, due on October 23 via Relapse Records. The band's first LP in over five years at guitarist Scott Hull's Visceral Sound Studios in Alexandria, Virginia. The CD is described in a press release as "a return to a raw, primitive sound and will feature 19 songs of their signature misanthropic grind." Polish death metal band Escape From has released a new single titled "Zainfekowany Obledem" (Infected by Madness) which will be featured on the band's first full-length album. The single is available for everyone for free! "Zainfekowany Obledem" has been recorded in spring this year in IX Studio under the supervision of Michal 'Urgul' Barski. Escape From has already a promo CD "Ciemna Strona Duszy" from 2007 and the "Opetani Okrucienstwem" EP 2009 to its credit. You can stream four more songs from the latter over on Soundcloud. Norwegian Death Metal band Chton will release their sophomore album "The Devil builds" the 15. September 2012 via the German label Godeater Records. The vinyl edition of the album is planned for early winter 2013. Digital distribution of the album will be handled by Morningstar Music to ensure the album will be available via all major digital stores. "The Devil Builds" was recorded and produced at Morningstar Studio with Arnt Obsidian Grønbech (Keep of Kalessin, Satyricon) at the helm. The album was mixed by Stamos Koliousis (Djerv, Mencea) at 210 Studio in Berlin, known for earlier work with Nattefrost, Gehenna and Vreid, among others. Chton has previously shared stages with bands like Morbid Angel, Behemoth, Mayhem, Amon Amarth, Zyklon and many others, and plans are being made for a European tour to promote the release of "The Devil builds". The digital split-single "Screaming for Death" (with Cleaver) is still available for streaming or download from most digital stores like Spotify, iTunes, WiMP, Amazon and many others. The Italian thrashers from Vexed have announced the title for their next record: "Void MMXII". The album will be released before the end of the year by Punishment 18 Records. The CD is being recorded at bunker studio (Milan). The album will be available in a 6-panel digipack CD and noble Gatefold 12" LP on September 21th. BLUT AUS NORD continues its parallel journey with the recent release of "What Once Was... Liber II". Never officially announced here, the record was released on July 5th. It comes in a "fake leather" rigid gatefold cover with gold hot foil print and 180gr black record. The layout was conceived by Helgorth from Babalon Graphics. In order to make this series a coherent corpus, "What Once Was... Liber I" is available again with a complete new artwork. It also comes in a "fake leather" rigid gatefold cover with gold hot foil print. The title, artwork and full tracklisting of BEHEXEN's upcoming fourth full-length are now disclosed. Imbued with an organic, evil sound, "Nightside Emanations" contains ten new incantations to the ancient ones. Front cover was painted by K. Lehto from Crimson Wine. The layout is being handled by Helgorth from Babalon Graphics. The recording of MONOLITHE's third full-length, heralded as a "progression in continuity", was recently completed at Red Reed Studio. "Monolithe III" will be mixed & mastered this summer by Andrew Guillotin at Hybreed Studio. Artwork was created by Norwegian artist Robert Høyem. The album will be available in a 4-panel digipack CD later this year. New Moloch compilation Released as CD at Metallic Media (Usa). This CD is a compilation of old, rare, unreleased and most important tracks from 10 years of Moloch's activity. Total playing time is 68+ minutes & includes a bonus video clip! Silver print booklet. Ultimate stoner/doom portal The Obelisk is currently hosting a stream of SWALLOW THE SUN’s “Emerald Forest and the Blackbird,” the title track off their upcoming new full-length. Click here to listen it. Set for North American release on September 4, 2012 via Spinefarm Records U.S., the 10-track offering was recorded during September and October 2011 by Mikko Karmila (Nightwish, Amorphis, Children Of Bodom) at Drumforest Studios in Viitasaari and Sonic Pump 2 in Helsinki, and by Hannu Honkonen at Noisework Studios in Helsinki, also in Helsinki. The effort was mixed by Hiili Hiilesmaa (Him, Apocalyptica, Amorphis, Moonspell) and mastered by Mika Jussila (Nightwish, Amorphis, Sentenced) at Finnvox Studios and includes a guest appearance by Nightwish singer Anette Olzon (on “Cathedral Walls”). Nethermost is a three-piece band hailing from South Texas. The name refers to the lowest point of existence. The band finished recording their first release, ¨Alpha,¨ in early 2012 and which is now planned for a release on Hypnotic Dirge. This 4-song work paints a deep and obscure timelessness, while offering up powerful and intense melodies. The lyrical theme illustrates nature and the elements, which have heavily contributed both adverse and promising effects towards the influence, creation, and end of all life. Purification have just published the tracklist and artwork for their forthcoming album. This one will be entitled "A torch to pierce the night" and hits european stores on August 10th. The album contains spoken words by Cro-Mags' John Joseph on the title "Wake Up". The outstanding artwork was done by Dave Quiggle who was also responsible for Coverartworks of Bands like Parkway Drive or Bury Your Dead. Be prepared! "Yesterday... Now... Tomorrow... Ever", the With All The Rage debut album, will be out on August 3, 2012. With all the Rage contains in the name the deeper meaning of grudge fed by the guys towards Sicily, a land stained by the conspiracy of silence and bigotry: ANGER. And the "anger" characterizes the WATR's sound, where a good mix of Northern European metalcore and robust American thrash metal meets an open-minded melody and a solid groove. The CD was produced by Ajeet Gill at "Hellfire II Recording Studio”. 06. Who Killed My Dog? After 5 years from its debut Subliminal Fear comes back with One More Breath, out on August 3 2012. An evolved sound, that has its roots in the Scandinavian school of Melodic Death Metal and doesn't disdain some raids on German Thrash Metal. Freshly returned from their Eastern Emergence Tour of the Canadian Maritimes, Montreal tech death shredders Derelict are pleased to confirm the addition of guitarist Simon Cléroux (The Unconscious Mind) and bassist Xavier Sperdouklis (ex-Vengeful) to their permanent lineup. "Simon and Xav have been with us since we released Perpetuation in April," comments Derelict vocalist Eric Burnet. "They have proven themselves to be hard-working musicians, as well as a lot of fun on the road! They both put a huge amount of work into learning our songs, and they're already both contributing to writing new material. We're looking forward to the next album being even more collaborative than Perpetuation."